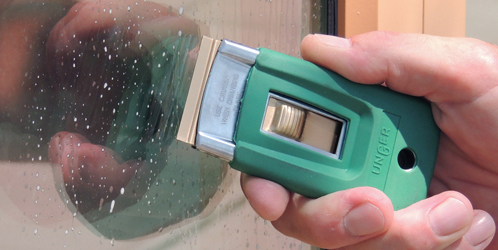 Our scraper tool selection offers everything you need to keep flat surfaces clean. Glass scrapers are perfect for removing paint and stickers. Grill scrapers keep cooking surfaces spotless. Floor scrapers will remove even the toughest adhesives. You'll find the right cleaning scraper for the job, whether your cleaning calls for reversible blades, extra safety features, or adjustable working angles. Work safer, faster, and produce a better clean than ever before! Lightweight with an ergonomic handle, our glass scrapers feature a reversible carbon steel blade, making it ideal for cleaning larger surfaces. 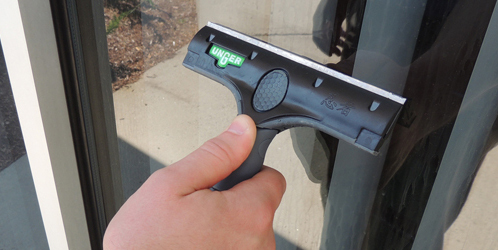 The handle easily locks onto the ErgoTec® Locking Cone Pole Adapter for use with all Unger poles. 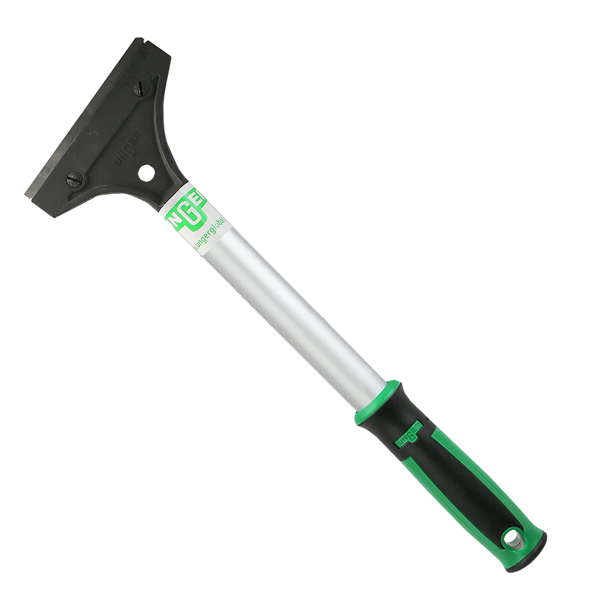 Whether you need a heavy duty scraper or a lighter weight version, Unger's line of floor scrapers are an efficient tool of choice for the job, featuring a reversible sharp/blunt blade to handle it all, from gum and heavy dirt removal to stripping tile floors and removing carpets. 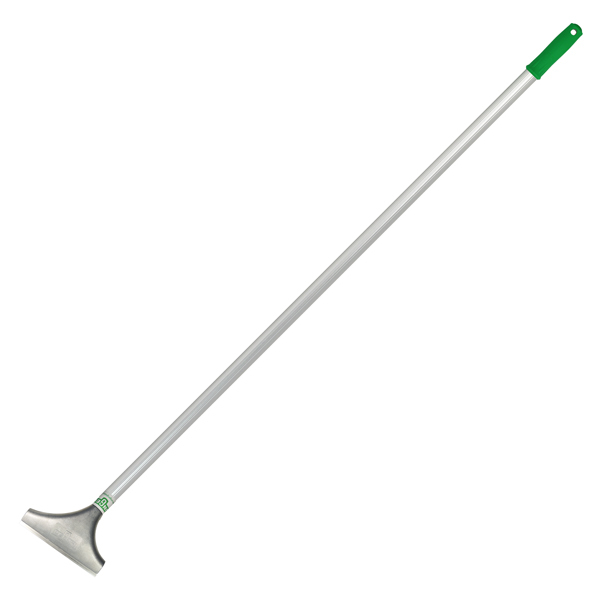 Using a long handle scraper also affords cleaning staff convenient operation while comfortably standing. With the reversible stainless steel blade, burned residue, grease and food buildup don't stand a chance against Unger's line of food scrapers. And with a long handle, these scrapers will keep your staff clear of the heat of the grill and flattop cooking surfaces, while giving them the ability to clean otherwise hard to reach areas. Keep your glass surfaces pristine. 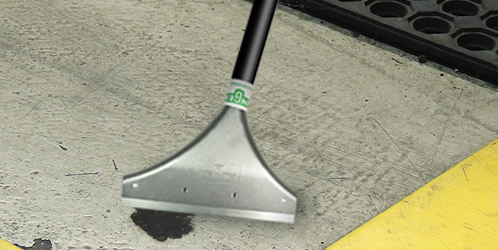 This selection of scrapers offers anti-slip handles and protective caps to ensure a safe clean. Choose from a variety of sizes, safety features, and adjustable heads to guarantee that your custodians always have the perfect tool for the job. Lockable holsters increase productivity and keep workers safe. These purpose-built scrapers are the next step in keeping glass surfaces sparkling clean. These scrapers are the perfect tools to keep floor surfaces clean and safe. Their ergonomic grip design and hang hole are perfect for use in any facility. 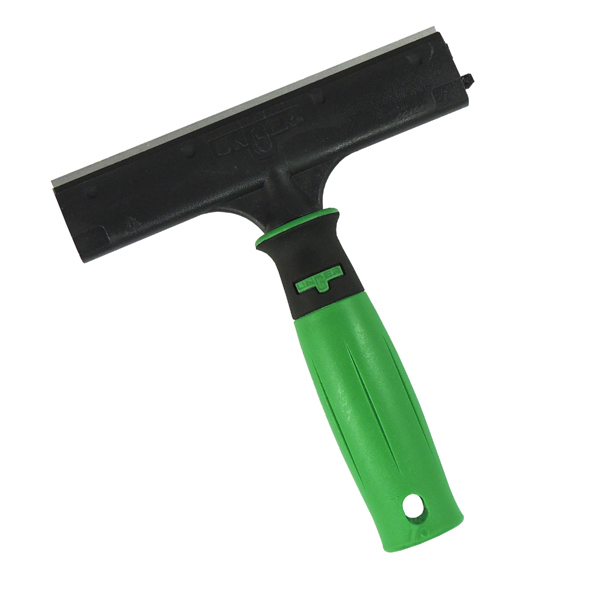 The heavy-duty scraper is essential for serious jobs, such as stripping flooring or heavy adhesives. Tape, heavy dirt, stickers, and gum don't stand a chance against the medium and light duty scrapers. No matter your floor cleaning needs, these scrapers will get the job done. Take your kitchen's cleanliness to the next level with these griddle scrapers. Ergonomic handles and reversible blades make it easy for your staff to remove burned residue or grease buildup. These long-lasting, rust-free scrapers will keep your grill spotless!